DROPPINGS YOU WANTED TO LOOK THROUGH." 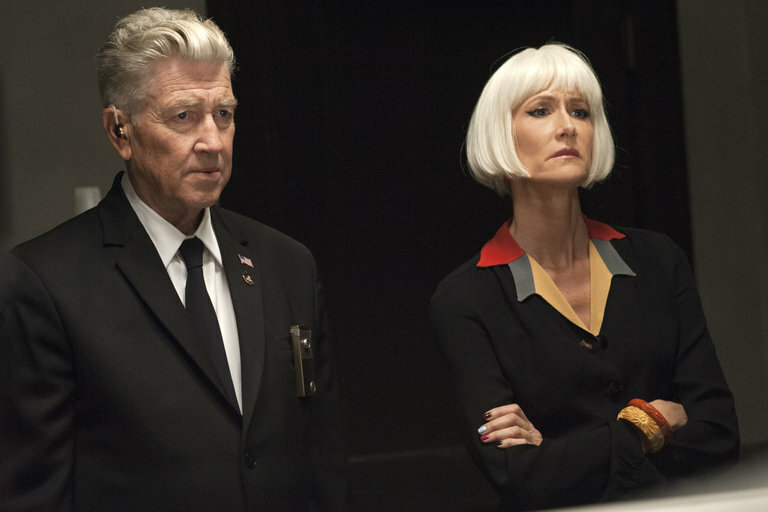 Two weeks ago David Lynch gave us one of the most stunningly surreal, mysterious, and artistically bold hours of television ever made with the already-mythical Episode 8. A surreal fever-dream that tantalized us with possibilities while still holding tightly to its mysteries, it was the most purely bizarre thing Lynch has made probably since Eraserhead, and the fact that he made it for a major premium cable network is nothing short of mind-blowing. Even for a creative mind as unpredictable and unique as Lynch, the question must be obvious: where can Twin Peaks possibly go to live up to that? The first part of that answer is of course to take a week off, ostensibly for the holiday, but also to give people a chance to digest the madness that they had just witnessed. Now Lynch is back, and he did perhaps the most unexpected thing he could have done, although there is quite a bit of logic to it: he followed the most surreal episode of Twin Peaks yet with one that is extremely narratively grounded. Episode 9 propels the show's many plot threads forward – a lot – and proves to be almost as satisfying as last week's insane dream, if in a totally different way. "He died of a brain aneurysm while trying to figure out the last part of Episode 8." The thing that has made the new season of Twin Peaks both so captivating and at times so challenging is that it has an almost insane (for anyone but Lynch) amount of plot threads going on. 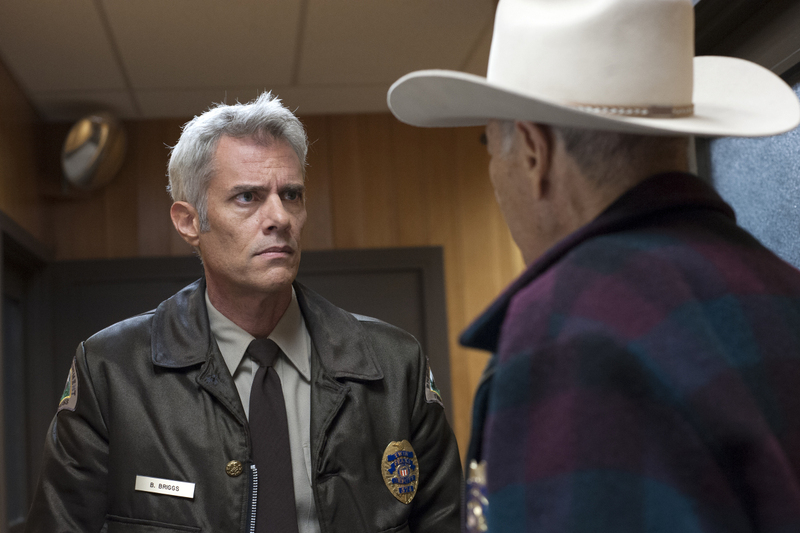 The show has branched out way beyond Twin Peaks' city limits, spanning the country with a web of mysterious events that in the beginning seemed barely connected at all. While this occasionally made the early episodes feel a bit choppy or scattered to some (I admit it, occasionally to me), it is paying off beautifully now in a way less like a television show and more like an epic novel. This world of disparate plot threads is now pulling together into an intricate web, with the strands spiraling closer and closer to one another, and converging once again on the town itself. It feels almost as if fate is drawing the separate parts of the ensemble together – fate, or the forces of The Black Lodge – as Lynch deftly assembles the puzzle pieces. The last few episodes (the surreal aside of 8 notwithstanding) have all tightened this web a good deal, but this episode has done more of it than all of them. In a true rarity, Lynch has given us a window into just about every one of the show's myriad of storylines, and some very big hints at how they all fit together. Of course, he adds some new mysteries too – how could he not – but after brilliantly pulling the rug out from under us two weeks ago, he is now giving us a genuine (if still very Lynchian) look at how the dots might connect, and it is a beautiful thing. 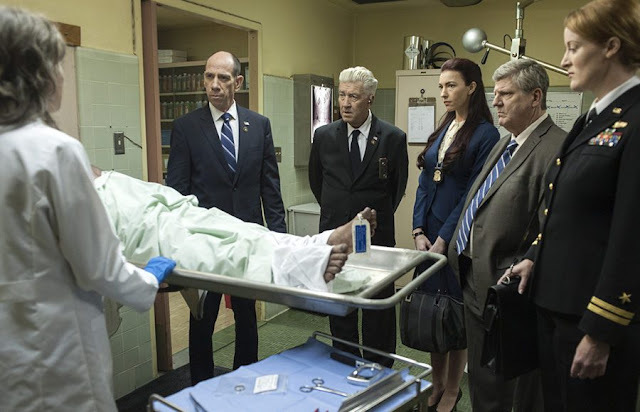 Of course, Lynch can't give us plot in digestible bites resembling a typical TV show; instead he takes a “when it rains, it pours” approach, unleashing a Pandora's Box of Twin Peaks concepts all at once. Like episode 8, this is one that viewers will really need to process, albeit in a totally different way. Yet despite that, the episode never feels overcrowded; instead each new insight is just as rewarding and tantalizing as those that came before, and they all provide some brilliant moments. The snarky, embittered chemistry between Diane, Gordon, and Albert is still a joy to watch, with Laura Dern once again giving a wonderfully abrasive performance which somehow manages to steal the show even from the late, great Miguel Ferrer and the larger-than-life Lynch. Meanwhile, while it is very bittersweet seeing Ferrer in such a prominent role knowing that he was suffering from cancer at the time and died soon after, he really is as good as ever (if noticeably more tired and subdued) as the acerbic Albert. As with the Log Lady and Doc Hayward, I'm so glad that he was able to return to Twin Peaks one last time as a farewell. But perhaps the biggest emotional surprise of the episode comes from Dana Ashbrook as Bobby Briggs: once famous for his over-the-top rebel histrionics in the original series, his performance here is remarkably subtle, heartfelt, and genuine as he goes through the emotional experience of remembering his complicated relationship with his father. Bobby is definitely the original-series character who has changed the most, among the ones we've met so far, and I really like how he is developing. Comparing who he is now with the Bobby we knew and didn't exactly love in the original, his growth adds up to quite a moving arc. With a strong mix of original-series and new characters, and with excellent development for all of them, this narratively-driven episode of Twin Peaks is a great success. This whole new season has (with only a couple slight bumps in the early episodes) been brilliant, but it is a great pleasure seeing the threads converge and take shape as the larger whole that we knew was lurking in the background. With this series Lynch is skilfully balancing both sides of his work: the compelling narratives we remember from the original Twin Peaks (as typified in this episode) and the dream-like surrealness that we love from his cinematic body of work (as typified by the last one). On both counts this show is absolutely great, and in that regard it is highly appropriate that the follow-up to episode 8 is an entry like this one. This is the water, and this is the well. Drink full and ascend. And please share this review.